Gurdwaras are fundamental part of Sikh faith. They are a place of worship, community and charity. For Sikhs, the Gurdwaras are tangible evidence of the underlying principals of equality, fraternity and spirituality of the Sikh tradition. These qualities are also very evident in the Gurudwara Sahib Quebec. 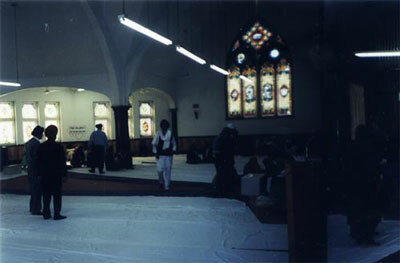 The Gurudwara Sahib Quebec was first started in 1983. During that time, and until 1986, the people of the community met in a Church to celebrate their faith and traditions. 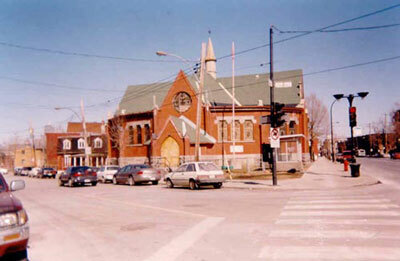 In 1986, the Gurudwara Sahib Quebec relocated into a more permanent place, a vacated Church located at 2183 Wellington Street. It has been about sixteen years since this Gurdwara has been meeting the needs of its community, acting as a central place of worship, social gathering and charitable works. The Gurudwara Sahib Quebec is open twenty-four hours a day, seven days a week as there are people who live in it (the Priest and two others). This allows members of the community to access their place of worship when they need to. The congregation is comprised of 75-150 members. It is a relatively evenly distributed population of men and women. A large majority of the members of long term residents who have immigrated to Canada. There are people of all ages who attend the Gurudwara, although the population of adults outweighs that of the youth by about 85%. Who does the kirtan (hymn singing)? In Sikhism, anyone who is capable of performing the kirtan can do so. However, in this particular Gurdwara, the kirtan is performed by the contracted Raagis. The Raagis are paid employees of the Gurdwara and are responsible for this part of the religious ceremony. As mentioned earlier however, it is possible for any member of the congregation to do the kirtan if they request so in advance. Who reads the Guru Granth Sahib (Sikh Scripture)? In this Gurdwara, the Guru Granth Sahib is read by the Priest. However, again as there are no restrictions to this, it can be recited by any member of the congregation. Since in Sikhism there is no such tradition of an ordained Priesthood, any man, woman or child is permitted to participate in the reading of the Guru Granth Sahib. Who offers the Ardas (the final group prayer)? The group prayer is offered by the Priest. Nonetheless, just as the hymn singing and the recitation of the Guru Grant Sahib can be done by anyone, so can the Ardas. Who distributes the Parshad (holy sweet)? The Prashad is distributed by volunteers from the congregation. Once the final prayer is offered and other announcements concerning the community and Gurdwara are made, men, women and children offer their assistance in distributing the Prashad. This part of the ceremony is not anyone's sole responsibility. 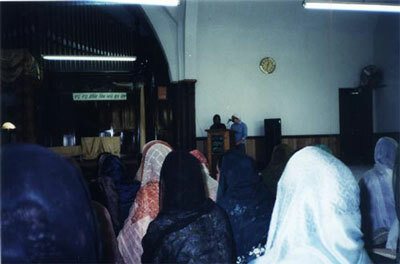 Rather, it is shared amongst those present in the prayer hall. During the ceremony that was witnessed on March 17th, 2002, the Raagis who are contracted employees of the Gurdwara performed the kirtan. It was wonderful to listen to, even though I did not know what they were singing. They performed the kirtan with such emotion, that it would move anyone sitting and listening. As well, if any felt compelled to, they could praise the Raagis with a donation (as some men did). The reading of the scripture was an interesting thing to experience. I think the most interesting part, however, was the fact that Beth (from our group) was given the opportunity to read the English translation of what the Priest had read. It was evidence that any member of the congregation, regardless of if you are a visitor or a Sikh, can participate in the ceremony. It was wonderful to make us feel included and a part of the service. I also liked the fact that they shared the English translation with the congregation. They acknowledge that not everyone understands the language of the scripture, and so they make it accessible for one and all. As well, they told us that the English translation is usually read by one of the youth. This is also another effective way to incorporate them into the service and make them feel connected to their worship. Although I am not fluent in Punjabi, I do speak Urdu and was able to understand a little bit of what the Priest was saying in the final group prayer. I thought it was really interesting the way he included prayers for members of the community. He personalized the prayer by asking for blessings for people's sons, wedding anniversaries and so on. It added to the immense sense of community that this Gurdwara advocates. What stood out during the distribution of the holy sweet was the eagerness to help with the Prashad. Immediately, and without any request, people got up and began to distribute napkins and the Prashad. It is really great to see that despite an absence of a system to the Prashad, it is done in a highly organized manner. As well, the youth (the younger children) were very involved in this part of the ceremony. They all got up enthusiastically and grabbed napkins and happily distributed them. The prayer hall is quite large. Although the congregation is only about 75-150 people, the hall has the capacity to seat well over that number. Because this Gurdwara used to be a Church, there are high ceilings, large, beautiful stained-glass windows and quite a bit of physical space. The altar is elaborated decorated as seen in the picture below. The altar is framed with beautiful maroon and gold coloured cloth. 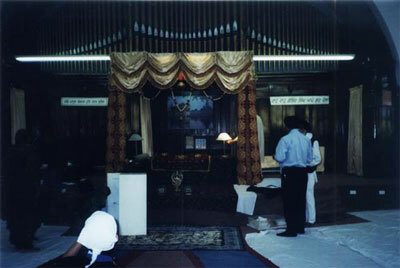 The altar houses the Guru Granth Sahib, and is where the Priest sits when reading from it. The Guru Granth Sahib is left open on the last page it was read from, but it is covered with cloth when not in use. hi front of the altar is a donation box for the congregation. When facing the congregation, to the immediate left is where the Raagis sit and sing the hymns. The altar is adorned with various other religious symbols and pictures. The seating arrangements for the congregation are such that women are seated on the right and men are seated on the left. There is no real significance to this arrangement. When we asked about the reasons for segregation, they explained that during the religious ceremonies, men and women should be focusing solely on God. The segregation helps to build and maintain this focus, rather than be a cause for distraction. The congregation sits on the floor, on white sheets that are spread throughout the prayer hall. When walking in the prayer hall, everyone must walk up to the altar, give a donation if they wish, and prostrate before God. After that, men go to their side and women to theirs. The arrangement of the altar was quite beautiful. All of the garments which decorated the altar were sewn by the President of the Gurdwara. Despite the fact that women and men were sitting separate, it does not contradict the idea of equality they advocate. Although there is gender segregation in setting, women are free to go to the men's side if necessary, and vice versa (which was seen during the distribution of the Prashad). Furthermore, the message of equality was still evident in that the men and women sat beside one another, rather than one in front of the other. In the Langar hall, everyone sits on the floor together, regardless of gender, race, religion or socio-economic status. There is no segregation or no inequality. Everyone sits side by side, in rows across from each other. The method of food services is a 'buffet' style of sorts. Everyone lines up to get their food like they would in a buffet, but unlike a buffet, the food is served to them rather than helping themselves. The meals are cooked on a voluntary basis by a family. Each week, a new family takes the responsibility for the Langar. If by chance a family has not opted to cook the Langar, the Gurdwara takes on the responsibility. Sometimes, a family will chose to cook the Langar meal because of a special occasion (an anniversary, a birthday, etc.) The Langar is cooked in the Gurdwara by the family and others who are willing to help out. Who Provides the Provisions For Cooking? The provisions for cooking are provided in part by the Gurdwara and in part by the members of the congregation. The Gurdwara provides for the pots, pans, cooking utensils, oven/stove, fridge, and so on. The families and other members provide the necessary ingredients for cooking. Sometimes members of the congregation donate things like flour, sugar and so on. However, in large part, the family that is cooking the Langar meal provides all the necessities (in terms of ingredients) for it. Who Cleans (dishes, kitchen, Langar Hall)? The cleaning of the dishes, kitchen and Langar hall is done by everyone and anyone who wishes to do so. The Gurdwara does have a cleaning person on the payroll, but that person is in charge of general maintenance. Despite the employment of cleaning personnel, the members of the congregation volunteer to clean up after the Langar meal. There is no rule that states those who cooked the meal must clean up afterwards. Rather, it is understood that the Gurdwara belongs to everyone, and consequently its maintenance is a joint responsibility. The food was served in a very orderly manner. Everyone was helpful and was making sure that we (the visitors) got something to eat. In line with us, I noticed a non-Indian couple. We were told that they come frequently to the Gurdwara for the Langar. I thought that it was wonderful the way the Langar is open to anyone and everyone. It really demonstrates the charitable nature of Sikhism. As well during the Langar, there were men who would go around to fill up your water glasses and refill your plate should you want more to eat. This showed that the community wanted you to really feel at ease, enjoy your meal and not be troubled to get up during your meal. What was great about that was the people who were making sure your needs were met, volunteered to do so, and were not asked. The seating in the Langar hall is a clear demonstration of the egalitarian nature of the Sikh tradition. There are no restrictions or rules governing the seating. Women sit with men, old sit with young, and so on. To emphasize the message of equality, everyone sits on the floor, at the same level so that there is no sense of class differences or power differences. The entire Langar process, from start to finish is one that clearly communicates the nature of the Sikh faith. In the Langar, as mentioned numerous times, the importance of equality and community are repeatedly emphasized. Everyone is willing to lend a hand and everyone is seen as an equally valid member of the community, even if they are not from the community. The notion of Langar is a wonderful one that should be emulated throughout society. Are there Punjabi language classes? Frequency? Yes, this Gurdwara offers Punjabi classes. They are held every Sunday morning between 10:30 a.m and 12:00 p.m. for youth. Are there religious classes? Frequency? There are also religious classes. They are held on Friday evenings on a weekly basis. We had the opportunity to meet with some of the students who attend the Sunday classes and with the teacher. The children were all very lively, as most children are. They seemed to enjoy being in class and were all very eager to have their pictures taken! 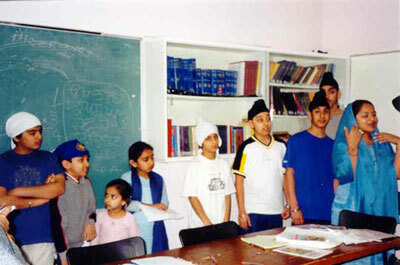 Students, young and old, were present in class (the eldest being about fifteen years old) learning Punjabi. In addition to learning Punjabi, the children also learn about Paath, history and culture. As well, children are encouraged to participate in special activities during occasions/celebrations. The Gurdwara also houses a library of books, CDs and videos in both English and Punjabi for the youth and non-youth. They are made accessible to promote learning about Sikhism and its roots. We were also told that we were more than welcome to make use of their resources if required for this course, and for our own personal learning. The visit to the Gurdwara was an enlightening one. I learned a lot about the Sikh faith and was able to connect a lot of what we learned in class to the actual practice. The Gurdwara is certainly a place where the notions of equality and community are obvious, hi everything that was done and in every observation I made, I found evidence of community and equality amongst the people in this Gurdwara. It was wonderful experience and it left me feeling very good about the sense of unity and caring that this Gurdwara exemplifies. I felt very comfortable and very welcomed during the entire visit.